I am thrown back, 4 of my health hearts are gone, and my real heart is in my stomach. “What was that! !” I shout. That was my first experience playing Minecraft with my son. He on his Kindle Fire and me on my HP Touchpad. It become pretty clear pretty quick that we had no idea what we were doing. 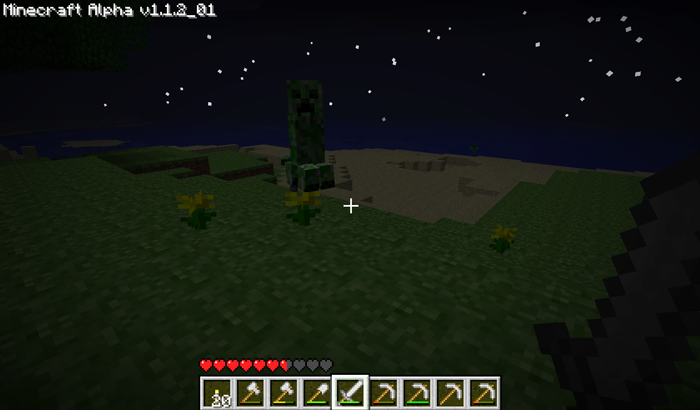 Can you spot the creeper? This was a rare opportunity for both my son and I to learn something together as we obviously had no clue how to play this game. I decided to involve him in the process I always use when trying to get a grasp on something I know absolutely nothing about. We got online and googled things like “how do I survive the night in Minecraft?” We searched for tutorial videos. We watched people that are incredibly too good at the game to see how they did. At each step we got back into the game and tried what we learned. Before long we could survive the night easily, craft all manner of items, build a home, defend ourselves, and go on adventures. This gave Jack a framework for learning something new. Research it and then try it to see what works and what doesn’t. Since we took on this challenge he has asked me to google things for him, he has sought out videos to learn things, and seems to enjoy figuring tough problems out. Minecraft, in Survival Mode, starts you off with absolutely nothing. You have about 10 minutes to go from nothing, to having a shelter to keep you safe from the nasties at night. We learned through trial and error what the right order of things was. Cut down trees, build a crafting table, build a wooden pick axe, dig out an open space in a mountain, get inside, block off your exit with dirt. From there, you begin preparing to further create your world. When you die in minecraft, you lose everything you’ve made. Some of which requires rare materials which could have taken you hours to find. So anytime you leave your home, you have to prepare like you would if you went out in the forest in real life. Gather and cook food, build armor, build weapons, create signs and torches. Each of those items requires exploring of caves and mining, it requires gathering of resources, and building other items. All of that planning has to be done or else you risk dying and losing your precious stuff. Now I can say things like “before we do X, we need to make sure we plan it out and are prepared, just like when heading on an adventure in Minecraft. It’s a lot of work building a world. We quickly learned that to get things done faster, we need to separate duties. So while I am carving out a living space, he is out cutting down trees. While I am gathering wheat, he is smelting iron. We stay near enough to each other at all times so we don’t get separated and if the other person gets attacked we can help. Rarely are we in each other’s way. In today’s world, effective teaming is an extremely important skill, one that I believe we are fostering when working together in Minecraft. In the creative mode of Minecraft, you can literally build anything. It’s very similar to playing Legos…except you never run out of blocks. You can build everything from the Starship Enterprise to a working 8-bit computer. My son has built some pretty crazy looking buildings and several rollercoasters that apparently pigs love riding in. It is an opportunity to imagine something in your mind and produce it in front you, which can’t be a bad thing. We limit him to 1 hour a day of game time on his tablet (although that is likely to get cut in half when he starts kindergarten). Even with that rule in place, enforced by software on his tablet, he still tries to get extra time frequently throughout the day. Laziness. Video games are an extremely easy source of entertainment. While there is a lot of benefits, the biggest concern to me is it makes it harder to enjoy other forms of entertainment. I’d like to see him draw more, build more legos with physical bricks, and do more pretend play with cars, trains, and figures. Wasted Time. I look back at the incredible amount time I spent playing video games, and this is back in the days of 8 bit graphics…oh wait.. Ok, Minecraft is 8-bit graphics, sure, but it’s also a lot more involved than Atari Boxing. I would give anything to have spent some that time learning how to program, learning electronics, or just practicing math. I don’t mind him playing Minecraft and if I am being honest, I rather enjoy our time playing together. There really are some benifits to playing the game. I feel that if we keep him limited in his play time while providing plenty of importunity for engaging play, then there is nothing to fear from Minecraft. I have embraced it as a hobby for him and nothing makes him happier than Minecraft time with dad. I know how he feels as I still look back fondly at my time playing the Atari 2600 with my dad. I remember playing Atari Boxing, Atari Basketball and Breakout with my dad like it was yesterday. Do you any of you play Minecraft with your children? Do you have any stories about when Minecraft seemed to teach your kid(s) a thing or two?